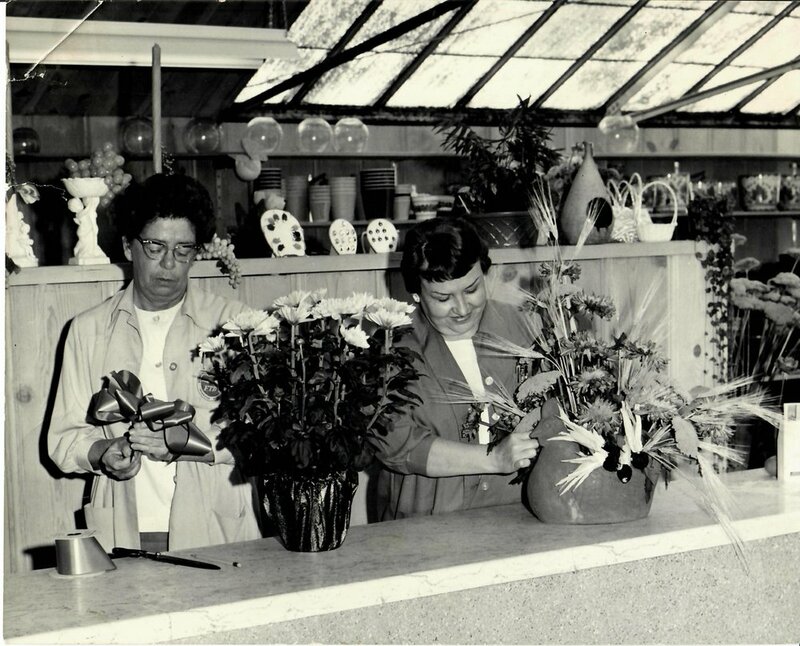 Did you know that when we first opened, we had no flower shop? The greenhouses up on the hill were used for growing & selling African Violets and some azaleas. 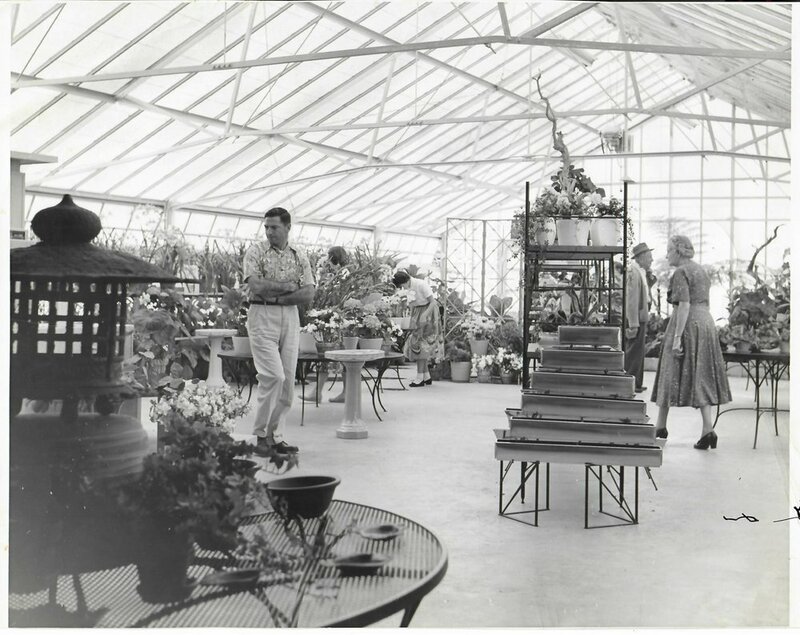 Once the Lord and Burnham greenhouse (a state of the art model at the time) was added, the florist department really took shape and in 1962 our “true” florist became a reality. This was the heyday of carnations, chrysanthemums, marguerite daises and roses. More blooming plants were brought in along with houseplants and a big fridge full of cut flowers for our newly hired designers. Terracotta chickens are still available, as well as the "bubble bowls!" On trend: faux fruit, ferns and chrysanthemums! A coffered ceiling! Our collection of silks or "everlasting" flowers can now be found in this alcove! This is our upper greenhouse, now used as storage for our Garden Shop. When reminiscing about our past, it reminds us that our business and in turn, our industry is always evolving and sometimes “everything old is new again”. As we welcome in the New Year we’re going back to our roots in a way and will bring you a wide selection of beautiful plants presented in a brand new environment. We are excited about our new look and invite you to come discover it for yourself. Please excuse our "mess” as we work on creating an inspiring place to let your imagination run free. 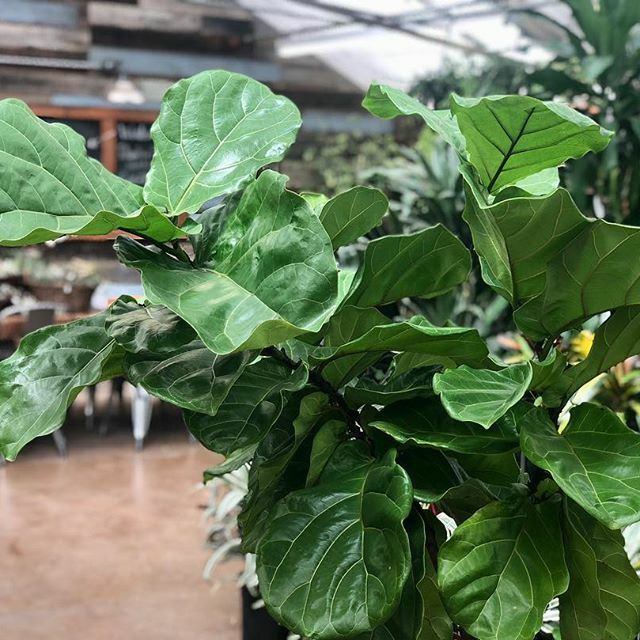 In order to accommodate a much wider assortment of indoor plants of all kinds, we’re making room by eliminating all of our fresh cut flower offerings. This will give us the freedom to make room for more of what you’ve been asking for! More blooming plants, tropicals, tillandsia, houseplants and all the lovely things that go with them that make your home, apartment, loft or office a welcoming place to relax and enjoy. Naturally, we will be continuing to send our lovely things as gifts for all your special occasions! If you need a designer for weddings and events, we highly recommend contacting Laura Vance at (510) 575-5591 and Sue Hayashi-Smith at (510) 457-8352 for an elegant and exquisite design. Come pay us a visit as we create a new and exciting atmosphere for you to shop and enjoy! 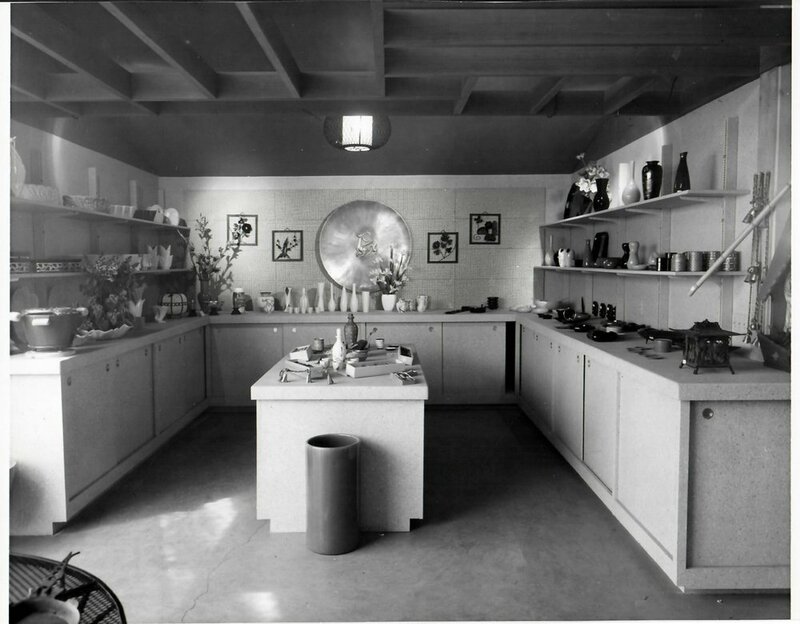 Love these old images of the nursery as much as we do? 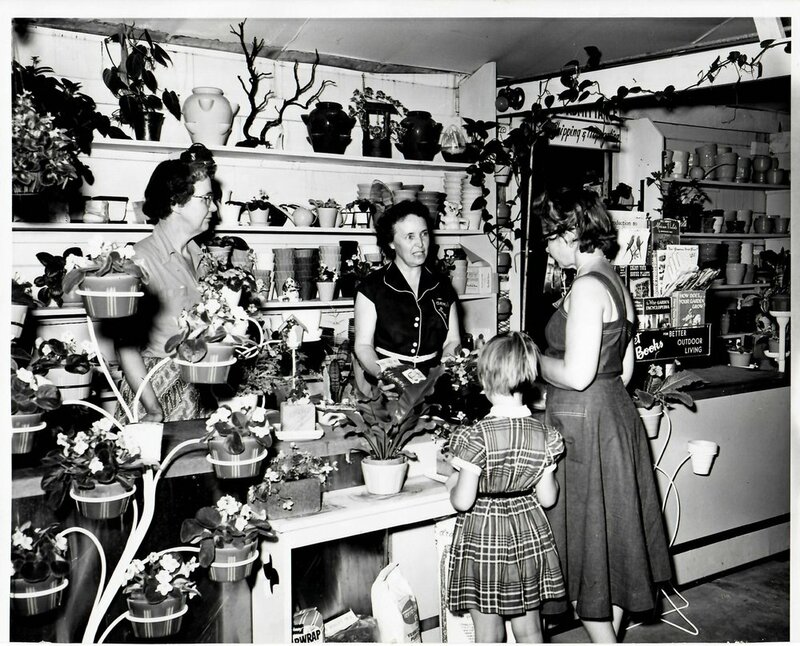 Then read on to The History of Orchard Nursery & Florist! Bromeliads bring a sense of the tropics into your home year round. 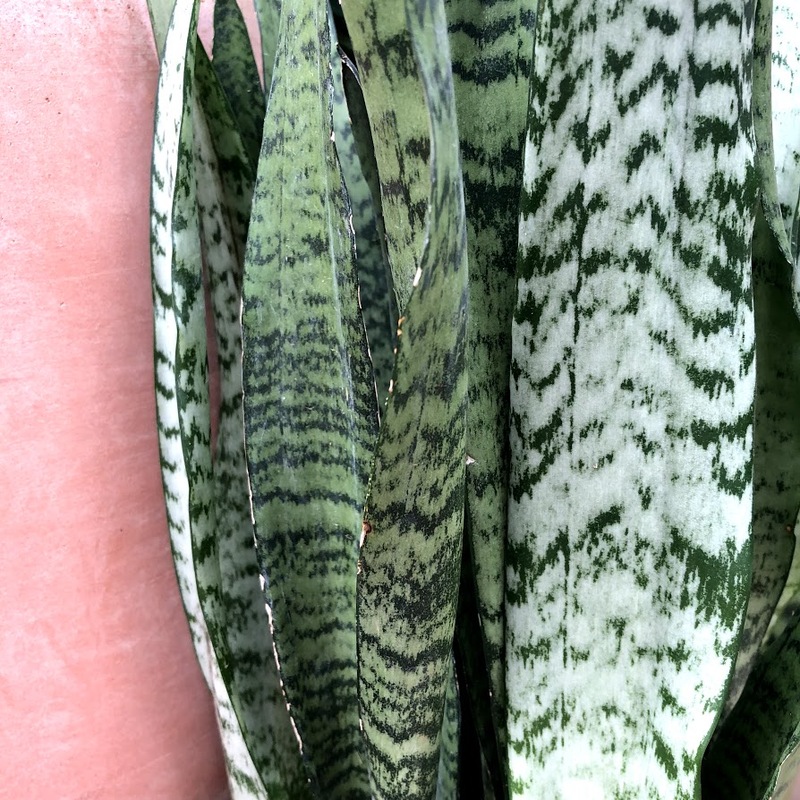 With a wide variety of texture and color, they create stunning focal points among common foliage-heavy houseplants. And with low-maintenance watering and care, they’re a perfect plant for budding green thumbs! Plant your Bromeliad in a mixture of bark and peat moss, both are available in our shop and florist. Most are epiphytes and in the nature, don’t require soil for nutrients and moisture. It’s important to not allow the roots to become compacted, once your Bromeliad outgrows its pot, be sure to repot it. Like most houseplants, pick a spot with bright, indirect light. Mist these humidity lovers weekly and you’ll be rewarded with healthy, green leaves. Water them from the top, pouring into the “cup” at the base of its leaves. They store their moisture there, so ensure that water is always present in its cup. For small Bromeliads that means roughly an inch, for larger plants maintain a few inches. A spent bloom and at right, pups begin to leaf out. Don’t be alarmed when your Bromeliad bloom begins to wilt. Prune off the wilted flower and you'll notice its offsets, or pups beginning to pop up. Note that this is not a time to necessarily re-pot. Once a pup becomes ½ and in some cases ⅔ of the size of the parent, you can detach. With or without roots present, don’t hesitate to put it into the soil, it will root. We recommend fertilizing once a month in the growing period and every 2-3 months during fall and winter. We recommend applying Grow More Bromeliad Food 17-8-22 or Epiphyte's Delight, both available in the florist! Meet Allison, our houseplant buyer and designer! Find her designing exquisite terrariums, tillandsia assortments and vertical gardens from her lush workspace in the florist. If you’ve got a question about your houseplant, she’s your gal! This week we talked to her about what she’s up to, her favorite plants and summer indoor plant care! What’s your favorite part about working at Orchard Nursery & Florist? Designing and being creative is the best part about my job. It's fun to come into work and create something unique with all of our beautiful plants! Fall is so much fun at Orchard! The Harvest Festival is in full swing and we all collaborate to create an amazing atmosphere for our customers. I’m a singer. I enjoy hiking, yoga and painting. And I love my cat, Kaboodle. I once played Sandy in the musical Grease senior year of high school. I also know how to shear a sheep! What is your favorite indoor plant? Allison with our chandelier Staghorn Fern. I do love Staghorn Ferns. They easily adapt to different environments and in the wild, grow on the tree tops! We carry them in assorted sizes that hang on your wall, creating a stunning focal point. And even one much like a chandelier! What are some of your recommendations for houseplant care in summer? It’s important to take notice of the sort of lighting your houseplant is receiving in summer. The lighting and heat is vastly different than in our winter and milder months of the year. If you are noticing crunchy tips or bleached spots, move your plant to a shielded or shady corner of your home for the next few months. How much should we be watering houseplants? You should be watering much more often in the summer months. Depending on your sun exposure, that could mean twice as much! This is true not only for houseplants but succulents and cacti as well. Be sure to check the soil and find a watering schedule that’s appropriate for the plant. 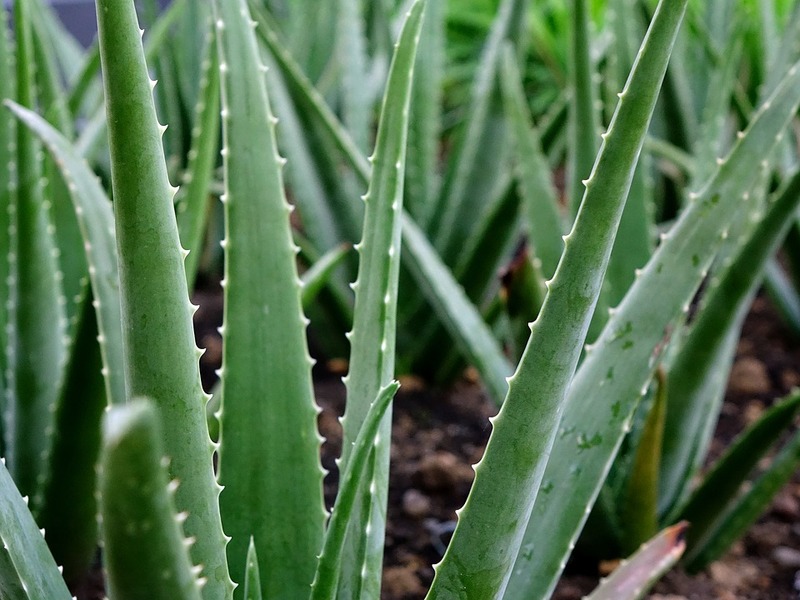 Indoor plants crave humidity so because we live in a dry environment, it’s important to keep them hydrated. 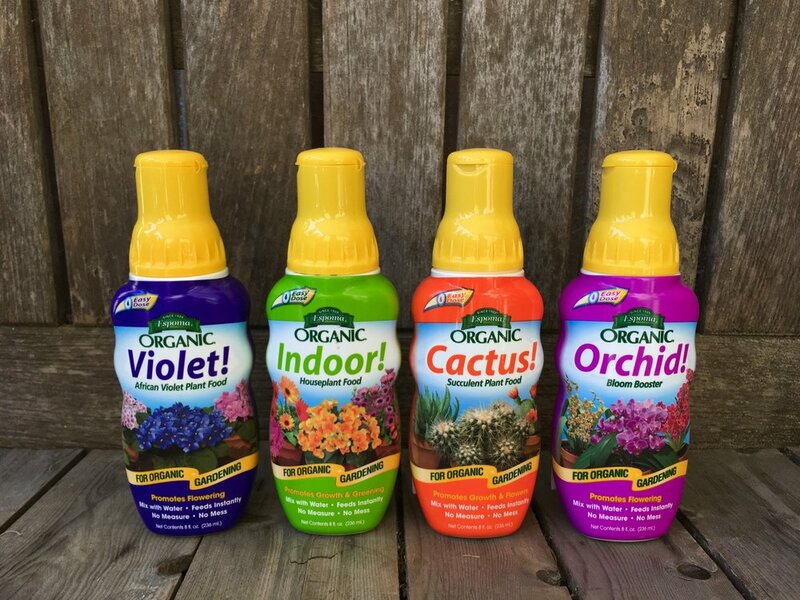 I love our elegant spray bottles that make misting a breeze. The spray bottles are also useful when dusting leaves. Keeping leaves dust-free not only increases the sunlight they absorb but can help deter pests. How often should indoor plants be fertilized? We are now in what we call the “growing season” meaning it's the time to be fertilizing! 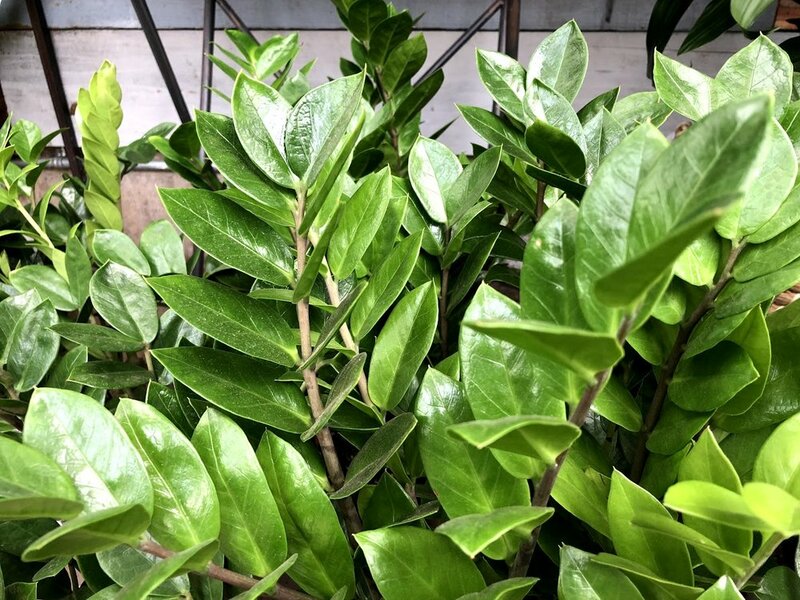 Your houseplant is using all their energy to push out new leafy growth and feeding them helps them through that process. 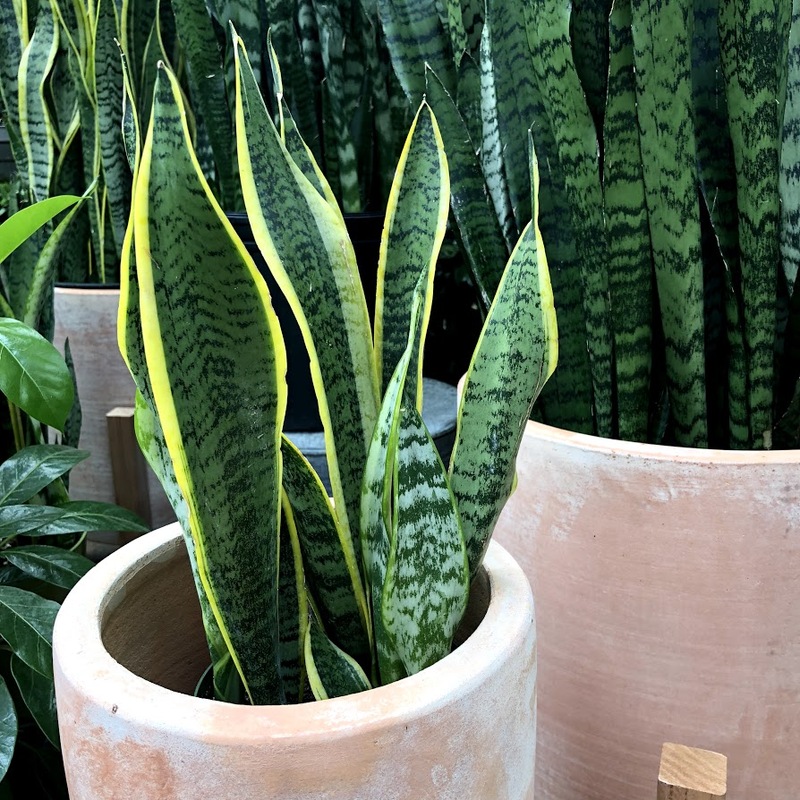 Although it varies on the plant (between orchids, African violets, cacti and houseplants in general) most plants want to be fed every or every other watering. You’ll want to continue fertilizing regularly until late September, early October when the growing seasons ends. During the colder months, fertilizing every month is sufficient. I recommend using Espoma Organic Plant Food available for a range of specific houseplants. The liquid concentrate contain natural proteins and beneficial microbes that promote growth and greening. Easy to use, just apply a few drops when watering. We are going to be carrying more Cymbidiums! Also known as Boat Orchids, they boast beautiful, long-lasting flowers that bloom through Fall. A low-maintenance and hardy orchid, they can outside thrive on your patio. Anything we should be marking our calendars for? Be sure to look out for my succulent pumpkin decorating class in September! If you are interested in booking a terrarium or kokedama class for a group of eight or more, get in touch with me! Next time you’re at the nursery, make sure to stop by the floral department and say hi! Tablescaping Ideas for Thanksgiving (and Beyond)! With Thanksgiving about a week away, it’s time to begin thinking about tablescaping! Decorating your table can be fun and have a great impact on the holiday atmosphere in your home, since that’s where you and your loved ones will be spending a great deal of time. Here are a few ideas that you can mix, match and make your own! If you’re spending Thanksgiving on the coast this year, there are beautiful ways to mix the aesthetics of the sea and the season. For example, opt for white pumpkins and a soft blue tablecloth with metallic accents and silverware. Or mix starfish décor with cornucopias in complimentary colors. Don’t be afraid to have fun and try something new! Rosemary acts as a beautiful décor accent and smells amazing, too! Use twine to tie it to name cards or floral wire to make small wreaths. The hunter green hue will pair beautifully with almost any color palate. Any leftovers you have can be added to your holiday cocktails for a chic garnish! The kids’ table at any holiday gathering should be full of fun, laughs and most importantly, something to keep them busy while the food is being prepared! We recommend using a large piece of craft paper as a tablecloth – this allows for doodles, tic-tac-toe, turkeys made from traced hands and simple clean up! No party is complete without a beautiful floral arrangement (or two)! We recommend shorter bouquets that won’t interfere with your guests’ line of sight as they eat. You can opt for traditional Thanksgiving colors or a more neutral combination – either way your guests will be sure to appreciate the beauty of fresh flowers in your home. We hope these ideas allow for a more stress-free Thanksgiving hosting experience! We all know someone with a loved one headed to college this time of year. Living in a dorm room is one of the most exciting parts of the college experience for most students. We, of course, think one of the best ways to make any dorm room feel a little more like home is to add plants! Here are a few that are sure to be great for small spaces and busy students alike. Money trees grow best in medium to bright indoor light and moist soil. While they don’t grow money (every college student’s dream), they are sure to add an air of sophistication and life to any space. Bamboo prefers light to medium light and no direct sunlight. Water every few days or grow it in a water-filled pot/vase and then sit back and enjoy the energy and beauty it provides. Peace lilies love light—the more the better, just no direct sun. Keep the soil moist. The Peace Lily will not only provide a fresh aesthetic, but will also work hard to purify your air.